The 3DS port of 2005's entry in the Metal Gear Solid franchise is slated for release in November. In a recent interview with trade publication MCV, Manager of Konami UK Pete Stone revealed the game's release month but didn't give an exact date. The interview mostly focused on other Konami titles in the works (Silent Hill: Downpour, Doctor Lautrec and the Forgotten Knights), and gave no other details on the anticipated 3DS port. The port first debuted at E3 last year as The Naked Sample, which was, more or less, a tech demo showing off the handheld's ability to replicate the graphics of the original PlayStation 2 release with the added benefit of 3D depth. 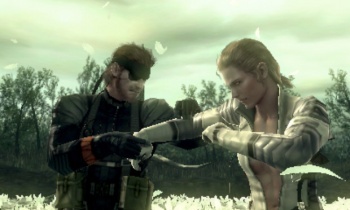 Konami has a history of adding new content to its Metal Gear Solid rereleases, whether its multiplayer (Metal Gear Solid 3: Subsistence) or a tongue-in-cheek skateboarding mini-game (Metal Gear Solid 2: Substance). In the past, series director Hideo Kojima said he is interested in adding co-op to the port, but currently there are no details or footage of any new co-op mode. Expect more details on this upcoming release at E3 next month.